Image by jonas_therkildsen via FlickrEver wonder what font that is when you look at logos? I do, but I'd never figure it out on my own. I'm horrible at figuring out fonts or deciding what font to use when I'm trying to do something special. Anyway, I found this list of popular logos and the fonts they used, and I thought it might come in handy sometime. 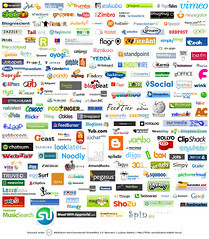 Google, Flickr, Yahoo, Facebook, and more - they're all here along with links to the fonts used. I still want to know which font they use on the 'got milk?' posters and t-shirts. Any ideas?